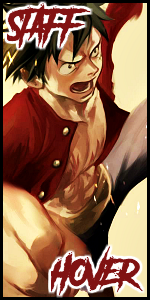 Strawhat » Paradise » Other Isles » Sandy Island » Alabasta » Alubarna » Voyage: The Tree! It's been well over a week since Burt seemed to have made his recovery. Though he is slower and doesn't spend nearly as much time in front of a forge as he used to. He is still trucking along as though nothing has happened. Sy however remains concerned over what the future could mean for Burt. Sy discovered this disease, this Coal Lung Disease, and yet Burt didn't seemed worried about it at all. Although this was typical of Burt's behavior, Sy was still determined to find a cure. This was one of the few things that Sy could do for a man that treated him like a son for years. Sy's only real clue left to helping him find any kind of cure was the white powder he had taken from one of the men's lungs that he had amputated. Its was investigation time, and investigations waited for no man. Sy grabbed the substance and placed it under the microscope in his lab and jotted down a few notes about it. The one major thing that stood out to was that part this substance was organic, and not something created by just use of chemical means. Part of it had to have come from a living plant, tree, fruit, or something alive. Maybe that was just a small part of the lung that Sy mixed in there, but no matter it was worth a try. Even though this appeared to be a big lead. It in reality really wasn't. Where do you start when it comes to wanting to check out all organic life in the city around you, but luckily for Sy this was Alubarna and even though the city was partially in shambles it wouldn't be hard to find someone selling local plant life. Another lucky part for Sy is the southern end of the city seemed to be the least effected by what was going on. Wondering into the market it was long before Sy spotted a vegetable and fruit cart. He bought one of everything the man had, and then Sy noticed an elderly man selling plant herbs. For a variety of reason people would come and buy them. Curious he asked the older man if could get a sample of everything the elderly man had for sale. With a quick chuckle he declined. "You pay, you get. Nothing is a sample here or free." The old man waved his finger at Sy as he spoke. Sy let out a hefty breath before pulling out his wallet and paying a bit of every herd and plant on the mans cart. It looked as though Sy had his day cut out him. He would get to spend the whole rest of his day looking through different forms of plant life from around Alabasta. Woooo, the excitement was resounding. Hours and hours drove on as Sy slowly pushed through the vegetables and then the fruits. Nothing was even remotely close to what he wanted, or needed. In fact the majority of the stuff never even turned white when put through a multitude of tests. Ranging from burning, crushing, cutting, smoking, ripping, freezing, and finally grinding. The process whilst tedious was a necessary one. A few more hours fly by as Sy had begun to study the herbs. Suddenly after fourteen whole hours Sy came across a clue. Some herb called the Diochi flower showed extreme similarities with the white powder substance. It was enough for Sy. The differences could easily be from inorganic chemicals added to the substance in order to make it poisonous. This was his biggest clue. "The Diochi flower, yes........ Wait. What is this flower even from?" Sy in his spoke to himself in his confusion. The studying of the various different plant life took Sy far into the night, as such he was left to reading through books about local plant life to try and discover where this tree might have grown. Most of the night was spent in endless fraught as Sy could find nothing on this flower. It was almost as if this flower wasn't even native to the land, but then again it had to be how else would the man from the shop have obtained it. After most of the night was spent searching Sy found it. The tree was listed under a book about local myths and stories, and about how it supposed grew in a cave underground deep within the desert. Though it stated it also stated later that the tree itself has had rare sightings, and most people who claim to have its leaves are doing so to make money off of people not from this area. The next day Sy waited outside the man's shop until he arrived. In Sy's hand sat the Diochi Flower. Was about midday when the salesmen arrived. His cart behind him as he strolled up and began to set it all up. Ignoring Sy as though he didn't even exist. Sy just sat there waiting and after an hour or two the man spoke. "The Diochi isn't a real tree. It's a fact just as everyone around here knows. That is simply the flower from a cactus plant that I labeled as such." The old spoke without even glancing at Sy, but Sy knew better and so he just sat there leaning against the wall waiting. There really was no reason for Sy to speak. To speak would mean he would have to try and prove the tree was real, which it was and the older man knew that. Which meant the older man could feel very confident about denying it. "Erghhhh, Having a giant brute such as yourself lording over me from behind isn't good for business." The old man had finally turned around and placed his hands on his hips as he stood there staring at Sy. "What exactly is it you want? To beat up the old guy who cheated you, your money back, or do you just want to see me go out of business? Hmmmm" The elderly gent was so livid that a giant vein was popping on his forehead. "Diochi Plant where?" Sy's voice was flat and face blank. It was clear he knew and he wasn't going to budge until he was given an answer. The old man looked him up and down and studied him for a bit, before nodding his head. "Five million Beli. That's the price if you want to know. Nothing less." Turning his head and looking slightly upward the old man spoke his words arrogantly. "Very well." Without a second to think about it Sy placed the money in his hands and waited for further response. It started with the elderly gent freaking out. He didn't know what to do with himself, and then it turned to fear that now he had to up hold his end of the bargain. "Very well, at dusk tonight meet me here." The elderly man marked a location on the map before shooing Sy away. Sy left without further hassle and got himself ready for whatever may lay in store for him. Dusk descended upon Alabasta faster than Sy had anticipated, and so he found himself walking to the area marked on the map. It was a secluded area outside of the city, perfect for ambushes, but Sy went anyways confident that he could handle anything that was thrown at him. Nearing the designated location Sy noticed a small sand boat waiting for them. The old man stood alone on the sandy shores waiting for Sy. As soon as Sy arrived the old man hopped onto the boat and motioned for Sy to do the same. It was a decent hour and half long drive before they arrived at a large cluster of rocks in the middle of the desert. There were rock formations scattered in other places but this set was much larger than the others. The old man stopped the boat and took down the sail. Then he tied the boat along the rock line, and motion for Sy to follow him up the rocks. They were almost shaped into the pattern of stairs, but rougher. A few rough steps down and the old man ducked before walking into a small hole in the surface of the rocks. Sy followed though he was just barely able to fit. After a around fifteen feet of hunched over wobbling through the tight little cave it opened up, and what appeared to be another set of rough stone stairs lead downward. The interesting part was the lighting in the cave. There was a faint purple light that bloomed throughout the cave giving it a very surreal look. Upon reaching the bottom the view before Sy was breath taking. A mild grove of tree all illuminating a faint purple hue was what was causing the purple light throughout. A large sized stone cave in the middle of the desert that housed a grove of Diochi Trees. It was a marvelous sight and there was easily thirty trees down here. It was a wonder that no one else had discovered it. Sy baffled as his sat there before this most wondrous sight looked back at the older man who had the largest grin on his face. "The Diochi Tree, everyone thinks its some super rare tree, buts it not. Outside of the healing properties that it's leaves give and the uniqueness of its sap it is a normal tree. This is only how the Diochi appears when growing in sand and its in total darkness for a life time." Turning around the old man pulled up a much smaller tree that was plain and boring. It looked like the tree commonly found around the oasis's and around Alubarna. "This is what the Diochi truly looks like if it were to grow on the surface, by bringing them down here I can create something special in looks, but it doesn't change the property of the plants in medicinal use or its sap use." So the entirety of The Diochi Tree is not a lie, the lie is the myth. The story that makes it appear super rare. In fact Diochies grow all around us all the time. We just never noticed the uniqueness of the plant cause it appeared like all the others. What a wondrous finding. "What do you mean the sap?" Sy asked confused. He only came for the medical use, and didn't even think of anything else, but if this tree could give him more than just medical use he would take it. "The sap in the Diochi makes a super flexible extra strong rubber-like substance. If you can figure out how to make it. Its one of the few things that differentiates a good electronic from an amazing one. Well that and the three+ million beli pay increase depending on what you are buying." Heading towards the stairs as he was talking the old man stopped at the first stone stair. "What do you intend to do with the Diochi, sir?" The elderly mans face showed curiosity but his voice rang of worry, almost fear. Maybe he sold some of this to someone else, or showed someone else, and they used this to make the poison. "I am going to make a cure for Coal Lung Disease as I call it, but basically........." Sy was cut off before he could finish by the little old man. "I know what that is,........ but a cure huh." The old man walked down and handed Sy back his five million beli. "I'll have four trees delivered to my booth tomorrow. They are yours free of charge. They will continue to glow so long as you keep them in a very dark room and use sand as your soil." Sy thanked the man on the way back to Alubarna. The trip seemed far shorter returning home. Upon arrival the old man left without a word. It was very late and he clearly had to make some arrangements to get Sy some trees. What is in a tree? The next morning Sy meet the elderly gentleman at his normal spot. The elderly man had brought four trees just as he said he would. He hand them over to Sy with a book. The book gave great details on the tree. Most of it was on how to raise one and keep the purple glow. There were bits and pieces about the rest of the tree but nothing major information wise. Sy brought the trees back to the lab he had in the den and began his research. The ultimate goal would be to enhance the healing properties of the tree, but he was also curious as to whether or not he could recreate this poison, and discern its affects. Firstly, Sy took a flower and ground it up to see if it still matched the powdered substance. It did still match the organic compound found within the powder substance. Now it was time to figure out what the other chemicals within the compound were. Sy began with a multiple mixtures of chemical, and nothing produced the desired outcome. Many out comes had been produced. Sy discovered that if the leaves were ground up and added to certain acids it neutralized them. This seemed to be effect when added to various poisonous plants as well. The Diochi flower appeared to be good as a neutralizing agent. Which explain how it was valued as a healing device. Neutralizing stomach acids, poison that were ingested, or even neutralizing intestinal bugs. Finally Sy came to his answer. Sulfuric acid was the substance used in combo with The Diochi Flower to create this substance. The Diochi Flower was ground up and dried out creating a white powder substance and then sulfuric acid was applied to the powder. The acid was neutralized by the flower, and so to the common folk it would just appear as a normal white powder. Maybe even mistaken for drugs. The third property, something else had to have affected this in order to make it kill, because in this state it was harmless. "What caused those men's deaths? This substance shouldn't be capable of harming anyone. Much less killing two people." Sy rampantly began to mumble to himself as he worked on other combination. Anything third item that could be added that would cause this neutralized substance to become dangerous. "All the men were affected by the substance, some took to its effects faster, but what did they all have in common?" Scratching his head Sy sat down for a second to ponder. Running through various scenarios he realized briefly after stopping to think. "The forge. The extreme heat from the forge. Well, no." With a hefty breath Sy sat back down. It couldn't have been that, because the blacksmiths apprentice didn't succumb to the poison near the forge as the other gentleman had. Unless his lungs were already burned and he had been toughing it out. Right up until he saw his teacher murder before him and the stress took over. So did the side effects. It has to be the forge. Curiosity driving him Sy took his microscope and some of the powdered substance over to Burts house. Walking into the room with the forge he set up his equipment and watched. The forge had only been running for a bit this morning but after it had been running for a few hours and the room was hot Sy noticed a change. The bonding between the acid and Diochi Flower weakened and it slow began to melt burn the bottom of the microscope. Heat was the factor. The high level of heat coming off of the forge weaken the neutralizing agent in the Diochi Flower and caused the once dormant acid to become active again burning the targets lungs. This explained how the two men at the forge were affected. It also meant that someone could have poisoned them well before they went there. If they knew that was their targets destination. One answer down, but another to go the sap from the tree. How does one make it into this substance? Returning to the den Sy put an idea into action. First he would make a diagonal slit into the tree, and place a piece of sheet metal that was slightly inwardly curved. This would control the flow of the sap and force it to run off into the barrel below. This turned into a project that took the rest of the day. The tree seemed to have an endless amount of sap. Once it was finally done it was time for Sy to get to work. First he applied an equal amount of sap to boiling water and let the water boil out, but the leftover substance was just a hot sticky mess that ruined the beaker he was using. Next was an attempt to just mix equal parts water and sap. This while didn't appear to do anything. The sap and the water just wouldn't mix. No matter what Sy tried the two never combined. It would explain what happened in the pot the water boiled away, but the sap just stayed a sticky mess in the breaker Sy used. "Hmm, what to do?" Sy was stumped, maybe he didn't need to do anything maybe it would just be best if he just waited that is how they made normal rubber from sap. You waited for it to dry and you had your substance, maybe the special properties of the sap, were in fact just from the tree. The tree itself was special and not the way the sap was made. The power of a Tree! Sy waited and waited for the sap to dry, but after another day nothing had happened. “Cannot waste the day waiting. Heheh.” Sy chuckled to himself under his breath. Luckily Sy had the perfect plan for exactly what he could do today. Sy decided to test out this poisonous substance that he had made. He wanted to get an idea of exactly how damaging it was. First test was in house, it was a test to see if the Diochi powder could neutralize the Diochi Acid, or if when the heat was removed the sulfuric acid was tamed once again by the already added Diochi powder. First test was the table. Sy placed with covered hands some Diochi Acid on the wooden desk that he owned. Then he lite a piece of paper on fire nearby. One could see as the Acid slowly began to eat away at the table. Putting out the flames and waiting till the heat had returned to normal Sy watched. Slowly but surely the acid stopped dissolving the desk. One more time. Same amount of Acid, and same amount of time near heat. This time we will add Diochi powder in a scant amount right after we put out the flames and see if that hastens the acids return to a dormant state. Applying the powder, igniting the fire, putting it out, and then Diochi powder. To Sy’s surprise applying the Diochi made the acid come to an instantaneous stop from what he could see. Going from a slow forty-second to almost minute of extra damage to instantly no more damage. Impressed Sy decided it was time for a test subject. Well a few. Sy remembered something from The Doctor about there being some low life thugs called the Golden Lions around her area. Maybe he could use one of them as a test dummy. It would be fitting after all, someone already used this substance to kill one of there. That is if it wasn’t one of their own men betraying them. Either case its time to find a subject. Sy didn’t have far to travel as The Doctor was relatively close to his lab. The hard part would be to find a member of the golden lions, and hope that he wasn’t a big wig. Thinking back to The Doctor’s house Sy remembered that the members of the lions that she brought in had a tattoo. This would be the marker that Sy was looking for. Assuming each member gets it in a different but visible location he just needed to be astute and find someone. First instinct was to check out the local tavern. You want to find the local gang thug that would be your best bet. Walking over Sy headed to Big’Ol Charlies tavern. Sure, enough without even trying to hard Sy could see a table of five of them sitting in the tavern. They all sat around laughing and drinking, and where the drink flows, so to does the urge to urinate. Sy waited for the golden opportunity to show itself, because he didn’t want to fight off four of them whilst trying to capture one. Then it came the chance to steal the man from his comrades. He wondered outside, because the bathroom inside was full. Sy stalked him as he walked around to the side of the building and was out of sight from anyone. Quickly Sy put the man in a choke hold until he passed out. Holding this limp, deadweight of a man was rather difficult but Sy prevailed and managed to get the man back to his lab. Without being seen by anyone to boot. “Okay, time for the tests.” Rubbing his hands together Sy put on gloves as he approached the young golden lion that lay shackled to the wall in Sy’s lab. Three loud smacks resonated throughout the stone room, as Sy slapped the man across the face to wake him up. “Hey, buddddy. I have a little task for you. Think you can co-operate?” Sy’s grinning face if what the thug woke to see. Boy, he wasn’t about what he heard. Instantly he started thrashing and screaming profanities. Saying something about who he was, and how his gang will come find him, kill me, and free him. It took so much effort for Sy to not just fall in laughter. “Here’s the deal. I’m going to put this powder on you, and then we are going to watch it burn you for a bit. Then I’ll put it out. Nothing to gruesome, but if you don’t stop thrashing around the powder will just everywhere and then you’ll burn everywhere. Let’s not have that.” Sy repeated himself three times, and then grabbed the powder and slowly began to sprinkle it. “Y…….yo…. you….you’re se….se ……se serious.” The gulp from the thug could be heard in the room over, and his once angered tone turned to fear. He was now shaking. Almost to tears, but he lay flat as if he had accepted his fate. “Smart cookie.” Sy encouraged the good behavior as he placed some powder on the mans arm. Then not wanting to burn the man he held a match near it and watched it slowly dissolve his flesh. Then he took the flame away and watched the thug writhe in pain for a bit. Wrote down some notes and walked over to his other arm. Same thing placed some powder on his arm. Held flame near it, and same affect. This time though as soon as the match went out Sy instantly applied Diochi powder to it. The thug seemed more than just out of pain. He seemed relieved. Maybe the Diochi powder has the ability to relieve some level of pain. Sy continued doing various test on different locations of the body. The hands and feet seemed the least affected. Which made sense they had the more callouses, and none of the burns were life threating. Easily treatable and would go away in a few days. Now the true test, how would this work outside of a controlled environment. “Hmmm. What to do? What to do?” Sy was pacing as he mumbled to himself to think up a plan. After an hour Sy had it. His horribly glorious plan. Here’s the glorious plan. Sy will pack a medium sized bag full of Diochi Acid, then have thug man run down the ghetto of the eastern part of the city, and then for the finally Sy will light a few buildings on fire while the man is running down the street. Then Sy will watch the outcome. This is what Sy was doing. It would be best to figure out which buildings to burn down first. He need to make it appear it was an accident. Sy left the poor thug to go scout. The poor man was napping anyways. “Alright, this is the main street it would be the busiest, if I follow it back near the wall of the city I can find the tent city of the homeless.” Sy now standing a few meters from the eastern main gate was in front of the homeless tent city. “Tents burn easy, but how can I get some of the houses to burn. Easily can run some oil from this area of the tents to this building. Will just place a decent sized amount of oil around this location.” Sy was marking the ground near the corner of a chain of houses that were feet away from the tent city. It would be the easiest set of houses to ignite from the tent fire. Now to get some houses across the street burning. There was a shop about half way up the street, they appear to sell a variety of things. Maybe some gunpowder or oil in the shop. Sy walked over and mulled around. Quite a few burnable things, and some lamps on the tables. On his way out Sy tripped and smashed into a table spilling oil all over the wooden support beams to the house and on the wooden tables holding up store stock. 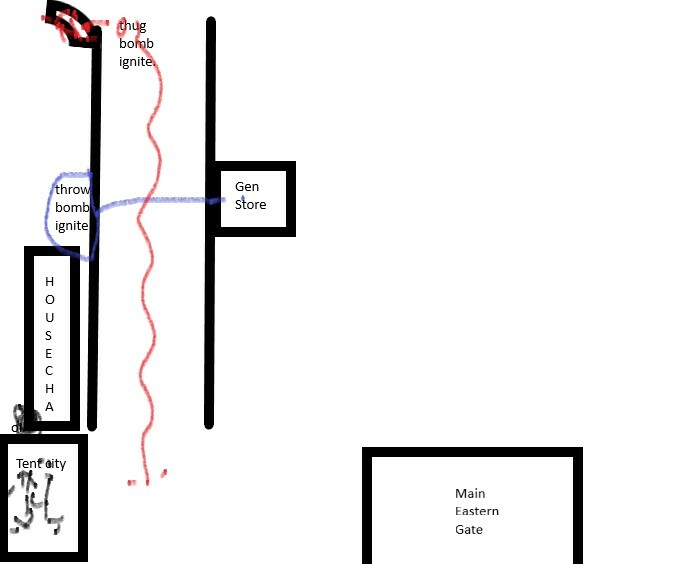 The last location would be at the end of the street on the same side as the house chain fire, but what could he do. This one might be beyond him. Unless no it would be to perfect the shop at the end of the corner was an ammo shop. This would be simple, Sy would just have the thug throw the bomb into the ammo shop explosion sending the white powder even more scattered. Oh this was going to be a testament to the true potential of this powder. The last thing Sy needed to do was buy some oil. Walking over to the larger market square at the end of the street Sy bought some four small sized barrels of oil, and a nice hooded coat. Walking back to the tent city Sy slow began to douse the already highly flammable tents with oil in small amounts as he slowly created a trail to the set of houses. There he splattered a very large amount of oil all over the back wall before placing the oil barrel on the ground against the wall. “All that’s left is to execute.” Sy walked home to grab his delivery system of the powder. Upon entering his lab, he saw his delivery system was still sleeping. So, he grabbed a few dice bombs and finished packing up the systems bag. Walking over to the thug he woke him, and shoved two things in his mouth. “Swallow.” Sy command as he held his hand over the mans mouth. “Good, you have just swallowed a bomb and some of that Acid I have been test on you. So here is the plan you are going to do exactly as I say or you will die. If you do as you are told I will give you the antidote to the cure which will stop the bomb from exploding in your stomach.” Sy spoke with a rather lax tone, but the thug understood the severity of his words and nodded in agreement. “Good, here is what you have to do. I want you to walk over to the main street of the eastern part of the city, to the entrance of tent city. Then I want you to open this bag and just run down the street while spilling this powder into the air. When you get to the end of the road there is an ammo store. You are to throw this bomb into the ammo store. Then your free and clear. Do you understand.” Sy motioned to the diagram he had drawn of his perfectly laid out plan. The thug nodded in agreement and they headed out. Sy trailed behind him a good way but was close enough to watch him. As soon as the thug neared the starting point Sy pulled his headband down and around his mouth right before throwing a dice bomb into tent city. The explosion startling the thug and he began to book it. You could hear screams coming from the tent city as it quickly went up in flames. People running out into the street screaming as this slowly burned to death, but the thug kept running. Sy met him at the next keeping up with him but behind the buildings and with his hood up to stay out of view he lobbed another dice bomb in between to buildings and into the General Store window. Just as it landed you hear a small pop followed by screaming. The white powder filling the air as the delivery system didn’t look back. All he did was keep running and scream fire. Nearing his salvation the thug fought through the pain that was now burning in his lungs. He had inhaled a decent amount of powder while running and screaming. The effects were taking their toll on him as he turned to the bomb he came under assault. The citizens blamed him for this and were angry they shoved him into the ammo store and began to wail on him. The bag had fallen onto a nearby cart. Already afraid for his life due to the contents of his stomach, and now under assault from the locals. The thug made the decision to just release the dice bomb he was given. Sy did not expect this out come though. That was an ammo shop that started to provide to marine. As such they started carrying large stores of powder and the resulting explosion quickly toppled the three-story building. Even worse the shockwave from the explosion ripped the bag to shreds and scattered the white powder across the entirety of the city. Now people from all across the city who were working near a source of heat would begin to feel the effects. While there wasn’t in there to cause death at least not that thinly spread citizens would be feeling the pain. Doctors would have a huge influx of patients, and a lot of places would close for the day. The eastern square though was destroyed as the fire spread, and people who had come into contact with greater amounts of the substances wander into the street blood leaking from their mouths. Others held their throats as they suffocated. What was happening while drastically insane, and kind of what Sy had expected was not at all what he intended. Even he himself had been blown back by the shock of the ammo store explosion. Sy had a broken a leg from the impact of the rock he hit from the knock back, but overall had many sores and bruise. Sy headed home to his lab, while defeated by the shear devastation he caused. He did however get his test, and while practical for combat use. It was not advised, well at least not with a half-cocked plan. That involved blowing up an ammo store. The truly good news however greeted Sy as he entered his lab to find the sap had finally dried out. He had his rubber, and it was super easy to make, and hopefully no one spotted Sy. As the night raged on the fire spread further consuming more of the eastern square, and the sky had a faint red glow to it for the remainder of the evening. The screams didn’t cease either and filled the night sky. Creating a very eerie affect with the faint red glow. The destruction to the city would cease by morning, but the wails and screams continued. The time of mourning had just begun, and it wouldn’t end anytime soon. Sy only had two thoughts. He had hoped no one had seen him ignite the homeless camp, or the general store. Also, that he would reap what he sowed here today, and you should never have a half-cocked planned played out when you want to test something as volatile as drug warfare. The only thing aiding Sy is it was obvious that the man running down the street and the one who blow up the ammo store was a Golden Lion. Hopefully they could take the blame. 6 Re: Voyage: The Tree!